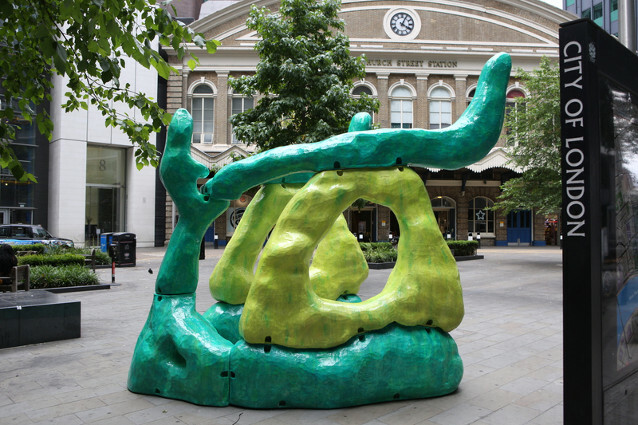 Originally commissioned by VITRINE for Sculpture AT Bermondsey Square, ’Synapsid’ (2014) is a large, vividly coloured sculpture which seems to morph between abstract, alien and animal forms. With its radioactive hues and blobby segments, ’Synapsid’ evokes sci-fi invasion scenarios where monsters rampage through the built environment. The sculpture takes its title from the scientific name for proto-mammals which evolved to have skulls distinct from those of reptiles; the structure of ’Synapsid’ hints at a cranial enclosure and eye-sockets. Viewers are drawn into Synapsid’s apertures and interior spaces, which are designed to be immersive, interactive and playful.